Are you looking to improve your reputation? Maybe you’ve had a PR mishap or social media mistake that you’re trying to recover from, or maybe you’re just new to the online game and you’re looking to gain some traction. Twitter is a great place to gain a loyal, supportive customer base. Follow these seven Twitter reputation management tips and your online reputation is sure to improve in no time. If you have customers on Twitter, chances are they’re talking about you.The good and bad thing about Twitter is that people love to talk about their opinions and experiences with businesses out in the open. Whether they’re hoping writing a complaint on Twitter will lead to a solution, or they just want to shout from the rooftops their love for your brand, if you have customers on Twitter, chances are they’re talking about you. Take notice of what people are saying and adjust accordingly. Are lots of people complaining about your customer service? Time to have a chat with your customer service employees. Do people love how quickly you reply to emails? Great- keep it up! If you’re going to be on Twitter, you need to be active on Twitter. It looks bad to set up an account and then ignore your messages and @ mentions. If you can’t answer your customer on Twitter, why should they give you their business? You don’t need to keep your eyes glued to the computer screen all day, but while you’re working online keep your page up, or, set up notifications on your phone so you never miss a beat. There will always be trolls. It wouldn’t be Twitter without them. Learn to recognize the difference between an unhappy customer (who you should definitely respond to) and someone who’s just trying to get a rise out of you. If their complaints seem arbitrary or a little too frequent, chances are, you have a troll on your hands. The best thing to do is ignore them. Find the people in your industry who are respected by the Twitter community. Not sure where to start? Search different hashtags that pertain to your industry. The accounts with the most followers and engagement are who you should aim to align yourself with. Start by retweeting them every now and then and commenting on their posts when you have something interesting to add. Eventually, you could even ask them if they’d be interested in a partnership. If you have similar audiences, the two of you could really benefit from working together. As a business profile, you should make a point to never get into an argument on Twitter. Even if you’re being called out by a troll, you’ll look more professional and like the bigger person (company) for not engaging. On a similar note, if something comes up in the news that your audience seems to disagree on, or even if half of your audience likes baseball and half likes football, it’s better to not pick sides. You never know what could turn a customer off. People love to engage with brands on Twitter. Get to know your followers. What do they like? What do they dislike? For example, as NFL season approaches, I may look through my followers to see which are NFL fans and tweet them a link to our NFL streaming guide. It shows I’m paying attention and take a genuine interest in the lives of my customers. Every successful brand page on Twitter has a specific voice. Pick a voice that encompasses who you are as a brand and stick to it! It seems easy- “What should my company sound like?” but I assure you, it’s no easy feat. The trickiest part is remaining consistent no matter the circumstance and no matter who is manning your profile. 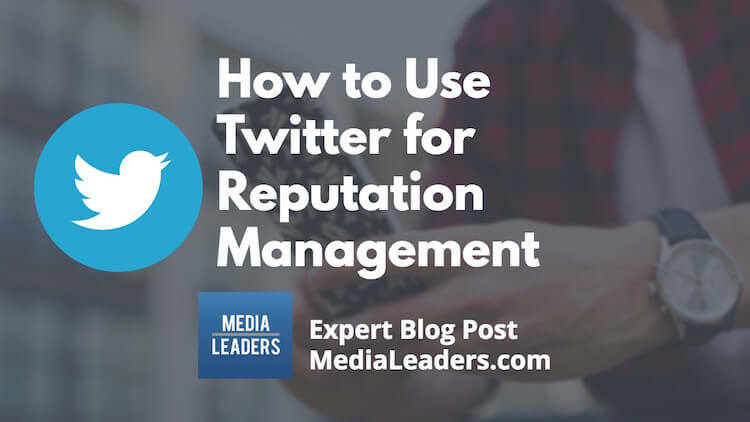 Even if you have a couple different people managing your Twitter account, it’s important to keep your voice consistent. Do you use Twitter for reputation management? Let us know in the comments below! After gaining experience freelance copywriting for various medium-sized businesses, Chris Brantner began building his own websites aimed at providing useful information in under-served niches. His current focus is on CutCableToday, a site that helps people learn how to cut the cord and still experience the digital entertainment they desire minus the expensive cable bills. Chris also serves as contributor for multiple tech blogs, including Motherboard (Vice Media), Houston Chronicle, DSL Reports, MediaShift.org, GoMohu.com, and more. Connect with him on Twitter. Learn more about guest blogging on MediaLeaders.